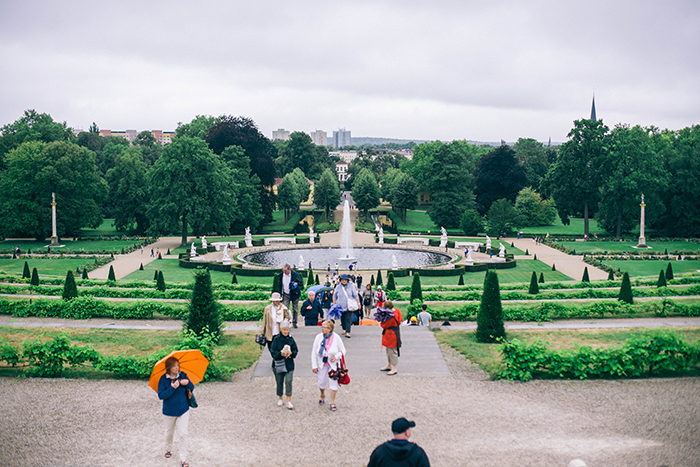 The one day it rained in Berlin was the day we had an entire morning and afternoon planned walking around in Potsdam! It also happened to be the one day I did NOT bring my umbrella. We ended up buying one after these photos were taken, but my apologies for the rude hair today! 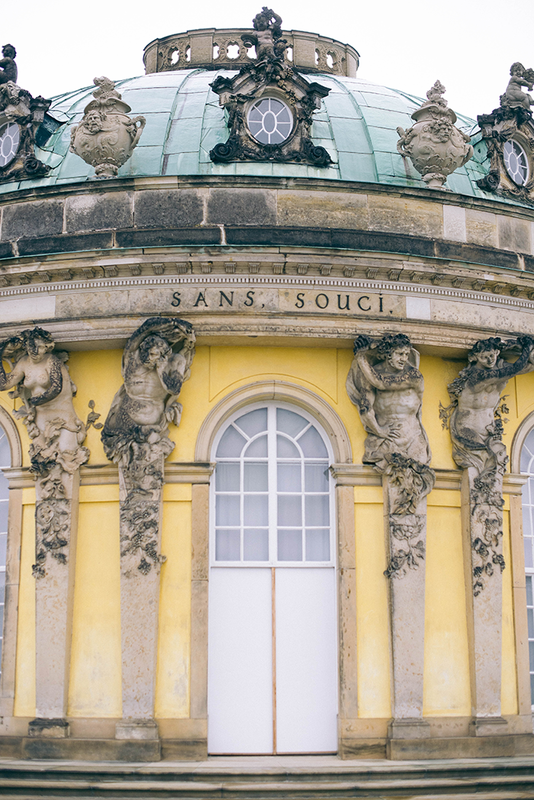 Sanssouci was my favorite palace we visited, if only for its beauty. The grounds and gardens were impeccably manicured and the interiors were gilded and glamorous, just as one would expect in a fancy royal abode! 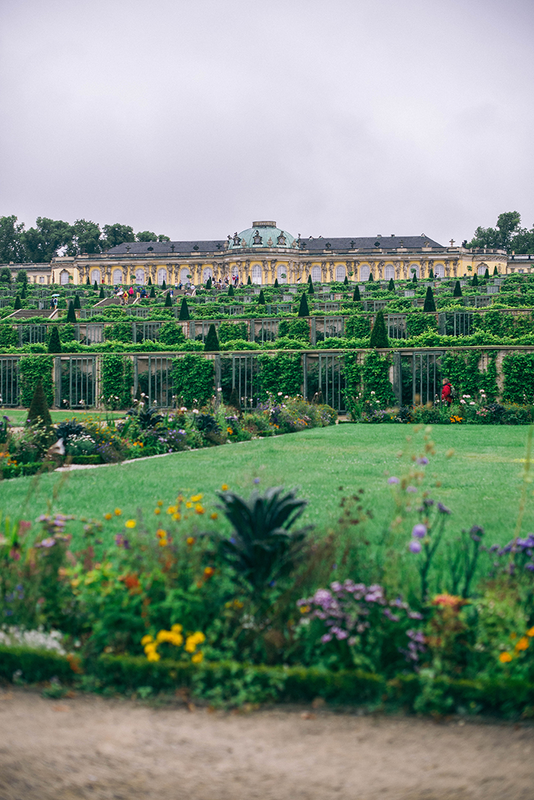 I wish we had known a little more about Potsdam before taking the trip, because I would have stayed longer! We arrived via a very small train station, and then left through the main train station which you have to go through town to get to. Potsdam is PRECIOUS! The little village has tons of cute restaurants and cafes, as well as a bunch of antique shops and other treasures. If I had known all of this, we wouldn’t have gotten in a cab right after our tours ended! Definitely something to keep in mind if you ever visit Potsdam. 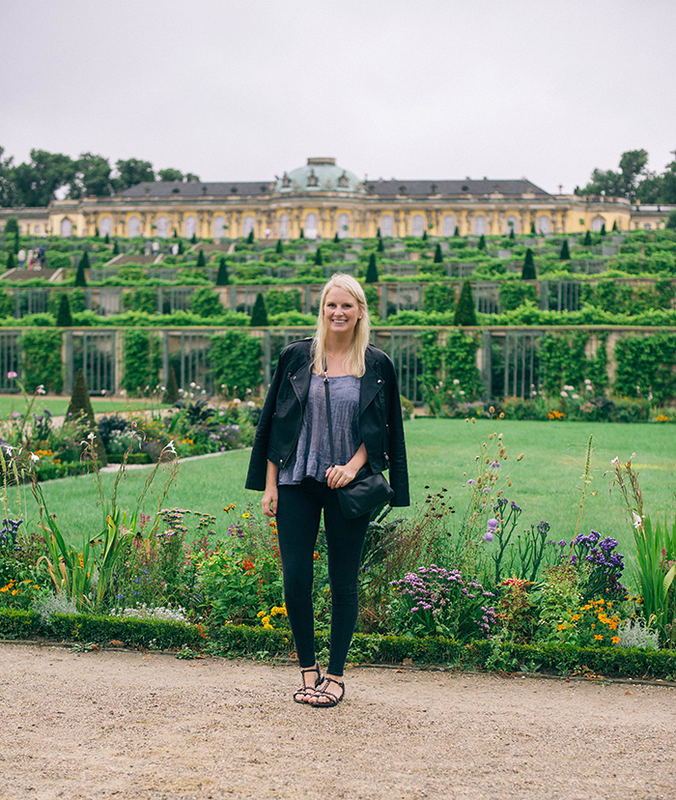 For more Berlin recommendations, be sure to check out my city guide that went live on the blog yesterday! Hope you all have an amazing Labor Day weekend! that’s the prettiest backdrop ever and great casual look. All I want to do is pull out my leather jackets right now! If only it wasn’t a million degrees in Texas right now! 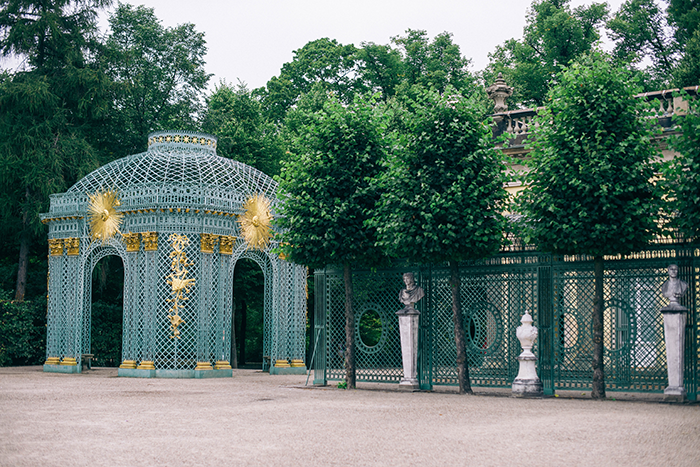 Sanssouci Palace looks SO gorgeous! Wow! Beautiful pics! Potsdam sounds idyllic. I’d love to get to Germany one day. I’m really enjoying following your travel adventures on Instagram! What a wonderful experience! 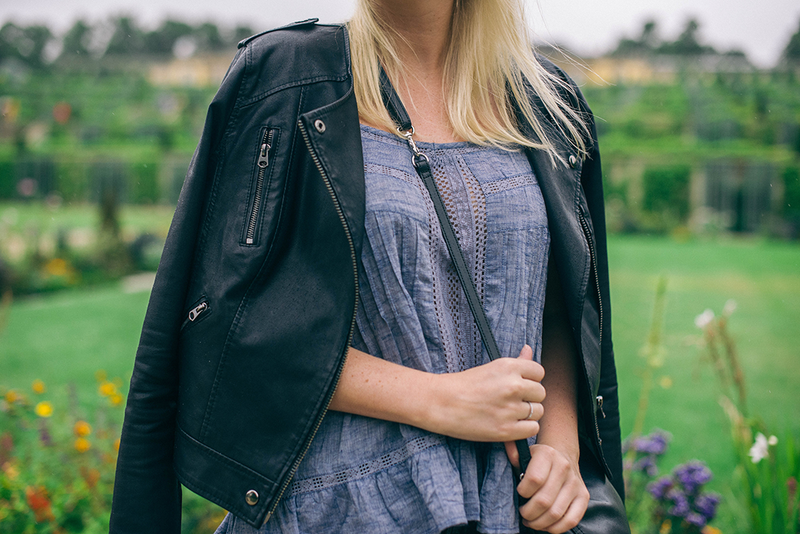 And I love your leather jacket…perfect for early fall and cool summer evenings! love this outfit and that great jacket!! What a beautiful palace! I lived in Germany for 6 months and visited various palaces. I was enchanted by their beauty. These photos are beautiful and your hair looks just fine! Obsessed with your jacket. I always hate it when things like that happen on vacation! Glad you were able to make the best of it. 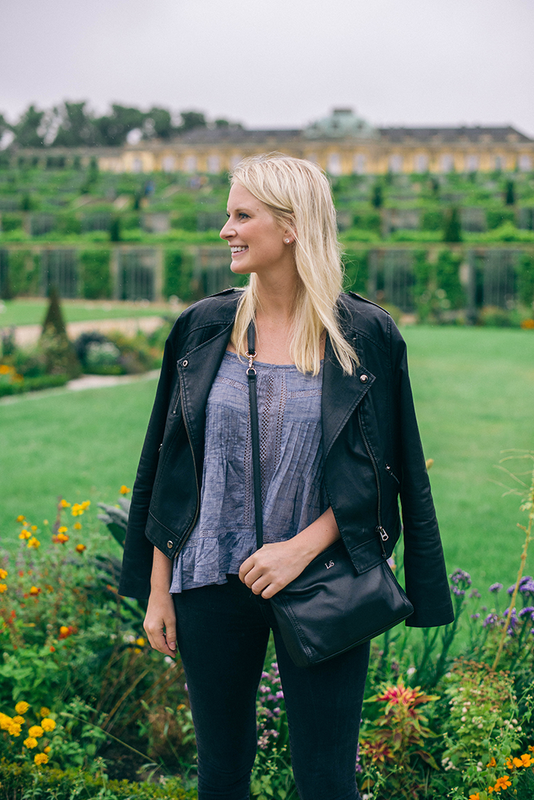 Love your top paired with the black. Love your top, Merritt! Hope you are having a wonderful time on your travels!